Mystery beauty boxes are an addiction. I will admit, I'm addicted. When a good box is released and I miss it, I'd grab the next one hoping it's just as good. When I get a not so good box, I hope the next one is better or at least not as worse. When a truly horrible box comes out, I'll avoid the subscription until I see something good out of it. Whatever the case, I can always talk myself into buying something or out of buying something. Memeboxes are no different. Memebox is a Korean beauty company that sells non-subscription beauty boxes. More information here. 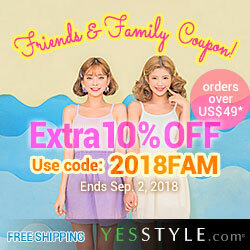 They also sell individual beauty products in their online store as well. Green Food Cosmetics was one of the boxes that I wish I had gotten but didn't. Luckily for me, my mom got it for me as my Christmas present, along with the Cleopatra box, Wonder Woman box, and Empress's Secrets box. I was ecstatic. 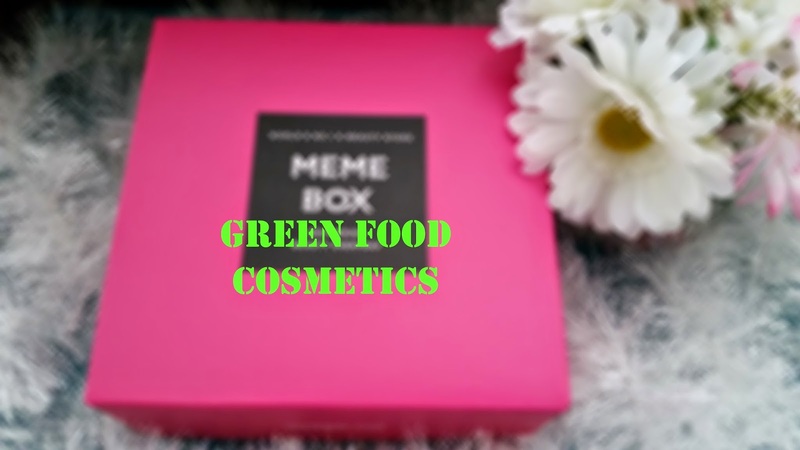 Needless to say, I'm absolutely in love with the Green Food Cosmetics box. Even though it only contains 5 products and it doesn't really fit the theme, it's still an amazing box full of worth while products. Let's dig in! Formulated with tea tree, peppermint, bergamot, ginger, and amber notes, this nourishing body lotion is perfect for dry and sensitive skin types. Its gentle formula is fast absorbing and not sticky. It's best to keep this product refrigerated. Even though this is a sample sized product, I'm still really happy for it. The herbal blend is enough to win me over, plus its got a pleasant scent. I haven't put it in the fridge yet, but it's kind of cold here so I think it will be okay. I wouldn't consider this a "green food" product, but it does consider green ingredients, if that makes it any better. Still love it and happy to add it to my collection. 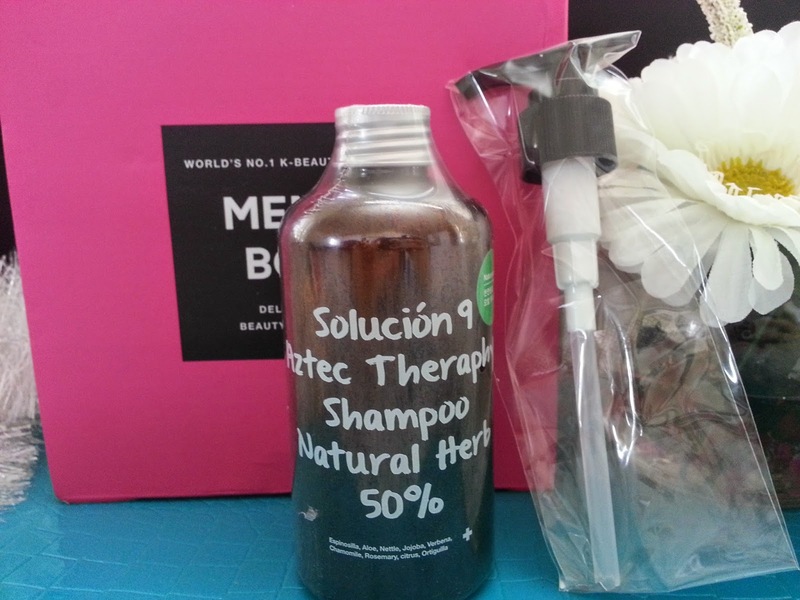 Incorporated with herbal and medicinal plant extracts, this shampoo helps to treat hair loss and prevents it. It's formulated with a blend of 8 natural herbs, which are espinosilla, nettle, jojoba oil, aloe vera, oritiguilla, chamomile, rosemary, and citrus. It works to soften and strengthen damaged hair, alleviate scalp blemishes, and deliver a therapeutic effect through its refreshing aroma. The first thing I noticed was that the word therapy is spelled wrong on the product. Someone should tell them. Although I've never gotten shampoo from Memebox, aside from those all in one products, I have gotten some amazing hair conditioning product that I love. So I figured I'd give this a try. This shampoo has got a rather herbal scent, I can't say I love it but I don't hate it either. It's okay and just different in terms of scent that my other shampoos. This shampoo kind of fits the "green food" theme, or at least its herbal blend fits. Will report back on how I feel about it after a couple of weeks. A roll-on aroma therapy oil that will relieve stress with its essential oil blend. The blend includes jojoba seed oil, peppermint oil, rosemary leaf oil, eucalyptus oil, lavender oil, and lemon oil. It can rolled over the wrists, temples, or behind the neck. You can also roll it on the area between the upper lip and nose. 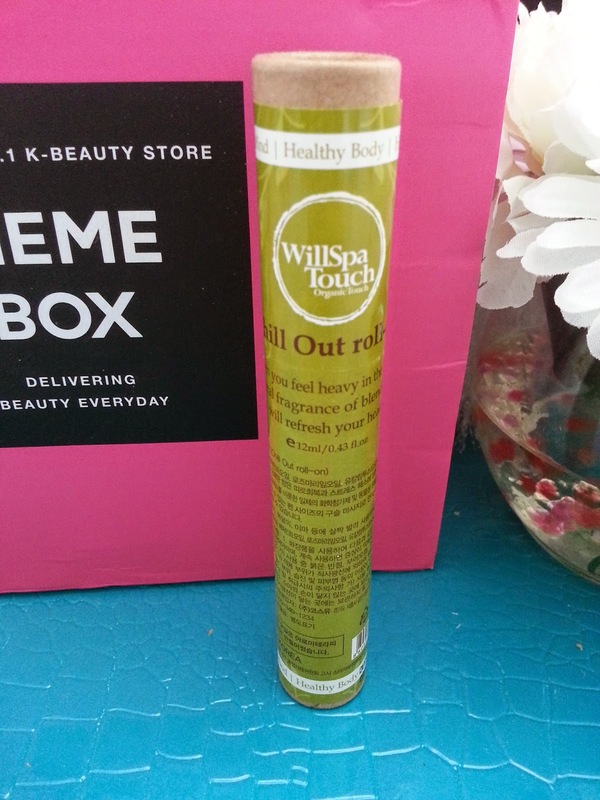 I got another WillSpa aroma therapy roll-on oil in my Cleopatra box. I got the Chill Out version, there's also a Breath Easy version with different ingredients. The scent for this one is peppermint like, so I actually like it. I guess this sort of fits the "green food" theme since peppermint is green. This product is adorable! It's packaging reminds me of those glass jar milk bottles and it also comes with a plastic spatula that looks like its made out of glass. I will definitely keep both even after I'm done with the product. It's got some amazing ingredients, while I wish I could use this now, I've got to finish my current cream before opening it. This essence will brighten and firm up dll and sagging skin. It's formulated with pure aloe vera leaf water (75%), niacinamide, galactomyces ferment filtrate, kiwi extracts, cucumber extracts and more antioxidant plant extracts. It will instantly soothes, cools, and hydrates sensitive and stimulated skin. 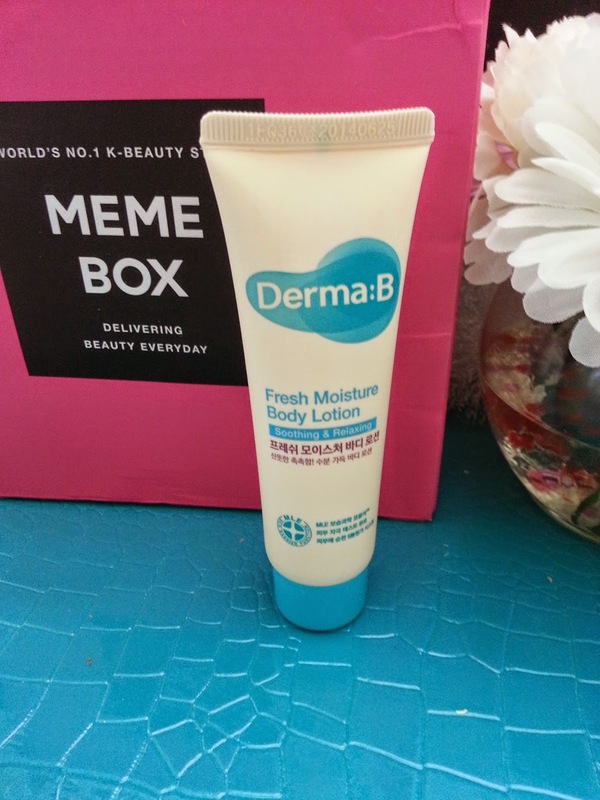 Its gentle formula can be used on all skin types and ages. 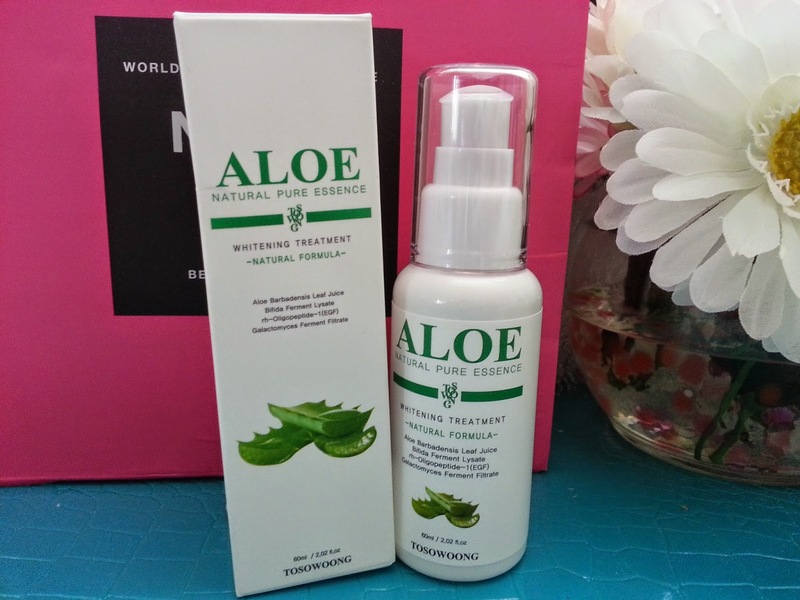 I love most aloe products as it's good for my acne prone skin, so this essence will come in handy. I also really like Tosowoong products since it's a good brand that isn't too expensive. The ingredient list is amazing and I think I will save this for the summer time. 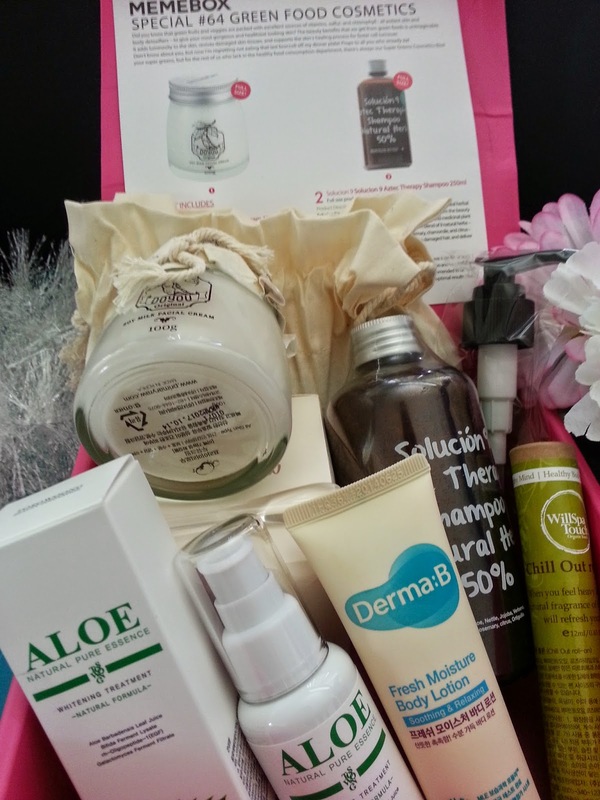 What an amazing box of products. There's not one item in this Green Food Cosmetics box that I do not like and I am excited to use all of them. The ones That I've tried, I already like a lot and the few that I haven't tried, I'm super excited to try when it finish my current products. It didn't really fit the theme but the products that are included were pretty amazing, so it's not a big deal to me. Overall, this is an amazing box and I am so glad I got this as a Christmas present!